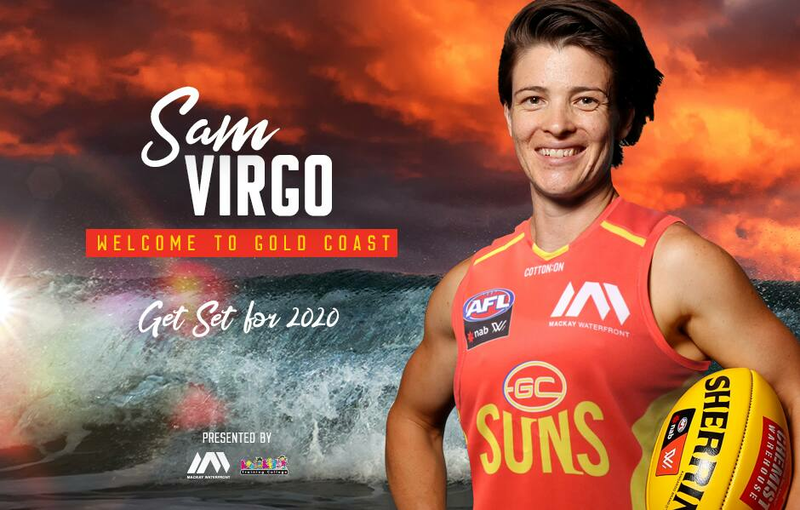 The Gold Coast SUNS have acquired veteran defender Sam Virgo from the Brisbane Lions in the AFLW Sign & Trade Period. Virgo has been a rock for Brisbane in defence, playing 15 games in two seasons. An ACL injury sustained in the 2017 QWAFL Grand Final ruled Virgo out for the entire 2018 season, but the 32-year-old was still invaluable to the Lions as team manager. Virgo said her desire to develop her coaching credentials was a major factor in her decision to move to the Gold Coast. “It’s the start of something special I think,” Virgo said. “The opportunity to develop myself in a football sense as well as my coaching was something I found really enticing and I’m really excited to develop both areas of my game and my life really. “I’m looking forward to seeing how I can have an impact on the younger girls in the team and those coming through the club’s academy, it’s pretty exciting. Virgo has been a strong leader for the Lions in her time there, being a member of the leadership group since the start. Born in South Australia, Virgo moved to Queensland in 2014 where she played her first game of women’s football. She met her partner Jenna playing the game and the pair have recently welcomed their first child Harriet into the world. Settled off the field, Virgo now wants to recapture her 2017 All Australian form with the SUNS. “I think now I’ve got a year under my belt since my injury I’d like to be a bit more consistent throughout my games and drive the standards for a young group,” she said. “I think that’s probably one of my strengths. “I’m looking forward to bringing them along with me and letting them teach me some stuff. Virgo becomes the 9th player to join the SUNS’ AFLW list following the commitments from premiership Bulldog Tiarna Ernst and fellow ex-Lion Jacqui Yorston earlier today.